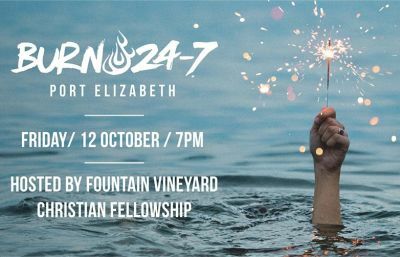 Burn 24-7 is once again extending the invitation for lovers of Jesus across Port Elizabeth to unite to seek God for revival in our city and our nation. The upcoming prayer and worship event will start on Friday October 12 at 7pm at Fountain Vineyard Church (22 Newcombe Avenue, Walmer Heights — behind Builders’ Warehouse). It will run for 24 hours, ending on Saturday October 13 at 7pm. Everyone is welcome to join in as and when able, with the freedom to come and go as needed over the duration of that time. A friendly request is made to those attending to please respect the attitude of worship while in the venue by keeping conversations to a minimum. The Burn 24-7 movement holds to the conviction that revival requires the unity of the Church, across denominations, ethnicities, ages and languages. October 12 marks two months since the opening of Fountain Vineyard’s new auditorium. Shortly after the opening, Fountain Vineyard hosted the citywide pastors’ breakfast and now this will be the first Burn 24-7 event to take place in the new venue. No doubt the Holy Spirit will bless this local church’s commitment to church unity as Fountain Vineyard continues to host the city for the glory of God and the advance of His Kingdom. Because worship fuels mission, there will be an opportunity to take the love of Christ to the community in an outreach event on Saturday October 12. This will run from 9am until 11am, meeting at Fountain Vineyard Church for a quick briefing. From there, the group will move to the Walmer Location Taxi Rank for a 9.30am start, so those who are not able to gather at the church can go directly to the taxi rank. The outreach will include praying for healing, power evangelism and “treasure hunting”. For any additional information about the outreach, contact Peter Gooch on 083 657 4213 or Ricky Venter on 083 528 1724. Sara Thackwray is a lover of Jesus who is passionate about leading people into God's presence through musical worship. She works as a freelance writer and copy editor, and also assists with the administration of Burn 24-7 in Port Elizabeth. Sara is married to Nic, and they have four children. They call City Lights Church home.